one/two … red/black … lost/locked … Looped sequences of similar short texts appear briefly on two screens mounted on monochrome boards (one red, one black) and are accompanied by two repeated sounds, with the asynchronous nature of playback causing slight rhythmic shifts. The work is a simple language play of lists; a meditation on the contemporary social fixation on acquisitive selfishness and ‘security’; a reminder of the inevitability of loss; and a poetic allusion to the romanticism of ‘lostness’; while the monochromes evince associative economic and political meanings built up around the colours red and black. 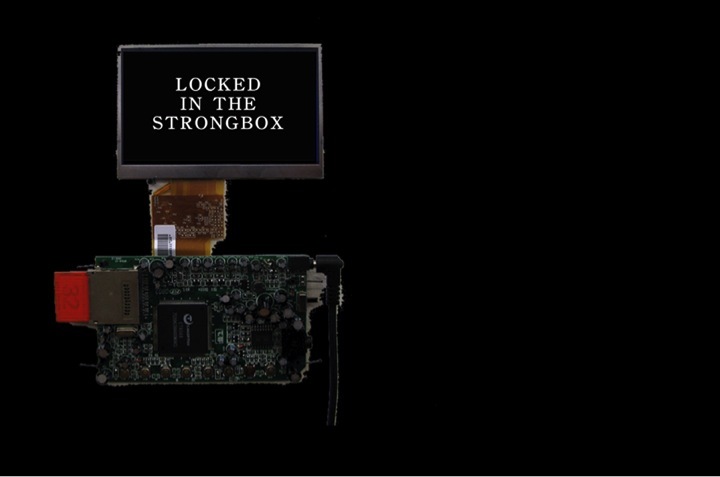 Disassembled digital photoframe displays attached to the screens expose the technological complexity underpinning consumer culture, whilst also combining with the screens to present oddly anthropomorphic ‘torso and head’ figures. Gary Warner has a 40-year history of making media and involvement in Australian and international galleries, museums, botanic gardens and visitor centres as artist, curator, conference facilitator, writer, creative director and digital media producer. He has led or participated in numerous development and delivery teams to realise a wide variety of innovative exhibition projects. He has also worked closely with leading artists and exhibition design and architecture firms, curated large-scale exhibition projects, directed and produced numerous multimedia installations, and researched and written interpretations of subjects spanning social history, natural sciences, contemporary art and Aboriginal and Torres Strait Islander cultures. While highly skilled in the use of digital media production technologies and softwares, he maintains a strong interest in hand-making, building small buildings, the adventure of materials and writing tanka poetry. Recent exhibition projects have included pencil drawings, folded paper and laser-cut plywood structures, and custom design of a timber and aluminium system for construction of geodesic domes. Open Friday to Sunday, or by appointment.